As a company holistic approach, 5s implementation in the office activities must fully support shop-floor manufacturing operations to eliminate waste as a means to improve productivity. When developing a culture of continuous improvement, 5S improvement steps mirrors our attitudes and behavioral patterns during the transformation process. Although not manufacturing, you can consider the office as a paperwork factory. Like manufacturing, adopting the 5S principles throughout the office and administrative functions increases efficiency. The 5S management philosophy eliminates waste and improves office organization and standardization. 5S serves as the foundation for continuous improvement activities and provides the base for applying other Lean methodologies. It also supports the cornerstones of employee engagement. Although 5S concepts are simple and easy to understand, many organizations fail in the implementation process. Companies mistake 5S as a spring cleaning program. However, 5S, when applied correctly, continuously improves workplace organization and improves productivity. 5S comes from the first letters of five Japanese words, namely, Seiri, Seiton, Seiso, Seiketsu and Shitsuke. 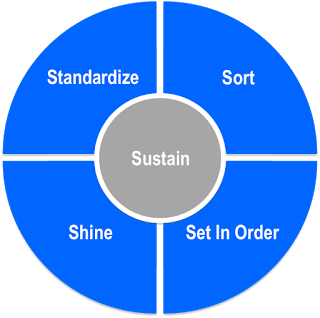 Translated to its English equivalent, 5S means: Sort, Set In Order, Shine, Standardize and Sustain. The first three S's: Sort, Set In Order and Shine build the basic pillars of 5S. They form the core of the 5S program and must become a part of every employee's day-to-day activities. The fourth and fifth S's support the implementation of the first three S's. Sort means to distinguish between the necessary and unnecessary. Get rid of the items you do not need. Go through all the desks, shelves, cabinets, files, equipment, storage areas, etc. in the office and discard unnecessary items. Keep only the essential items. Store frequently used items near the workstation. Store seldom used items further away. When going through the sort process for 5S implementation in the office, create a temporary collection area. If the employee feels the unnecessary object may have value for someone else, place the object there until all employees complete this stage. This allows other employees to review the items and keep items they may need. Set In Order during the 5s implementation in the office articles means to arrange essential items in order for easy access. Here you focus on functional storage and eliminating the need to look for things. All items should be arranged for easy access. For a good system, one can find any item in less than 5 seconds. There must be a place for everything, and everything should be in its place after use. Remove old and obsolete information on notice boards, intranet and the shared drive. Install cabinets for storing cleaning supplies and materials used occasionally. Label or mark off all storage areas. Align workstations in order that work is done. Ensure that the latest version of work instructions and job aids are posted. Remove hazards such as materials blocking corridors, doorways and stairways. Shine means to keep things clean and tidy. It should be understood that cleaning is a form of inspection. Divide office areas into zones and assign accountability. Obtain appropriate tools and supplies for cleaning. Inspect equipment and tools while cleaning. Repair faulty equipment, e.g. creaking office chairs. Clean your computer keyboard regularly by dusting off crumbs and cleaning with an appropriate disinfectant. Standardize during 5s implementation in the office means to establish standards and guidelines to maintain an organized office. Here you focus on standardization and the application of visual management tools such as colored labels and sign boards. Set in place rules and policies that support the first three S's, e.g. designated areas, proper labeling of storage areas, a log of what goes where, etc. Define a schedule for 5S activities and make it a part of the work routine. Put in place an emergency plan for fires, medical emergencies and natural disasters. Install automated external defibrillators (AED). Train new employees on the 5S system. Put up a bulletin board to keep employees informed and aware of the 5S system and activities. Reward and recognize participation and achievement in the 5S program. Sustain means to make 5S a habit and teach others to adhere to established standards. Make 5S a habit and develop a disciplined office environment. Regular communication of the 5S program, e.g. monthly newsletters. Regular housekeeping on your computer hard drive. Hold all-together cleaning sessions.Conduct monthly 5S inspections and audits. Gemba walk by the CEO and/or 5S steering committee members. Conduct monthly review by the 5S steering committee. Establish 5S standards and continuous improvement of the standards. Develop 5S manuals. Reward and recognize individuals and teams for good 5S practices. For a 5S initiative to be successful, make it an organization-wide effort. Senior management must commit and involve all staff. For successful 5S implementation, you must provide sufficient resources, manpower, training and publicity. Be sure to align the 5S program to the company's goals and objectives. Finally, there must be regular 5S audits and management review, as well as recognition and reward for good 5S practices.